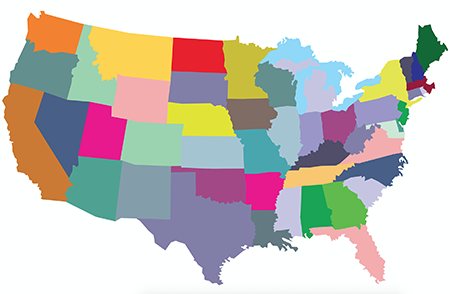 The Commonwealth Fund has released its 2015 scorecard measuring the performance of health systems state by state, showing many regions are improving on key metrics. Forty-two indicators are examined to arrive at the scores, measuring rates of children or adults who are uninsured, hospital patients who get information about how to handle their recovery at home, hospital admissions for children with asthma and breast and colorectal cancer deaths, among many others. The Commonwealth Fund notes that more states improved than worsened. Louisiana, Tennessee, Kentucky and Oklahoma ranked in the bottom quartiles, but they were among those that improved on the greatest number of indicators. There are wide variations in performance, with up to an eightfold difference between top- and bottom-ranked states. Reductions in hospital readmissions accelerated in 2012, when the federal government began financially penalizing hospitals with high rates of readmissions. Rates of potentially preventable admissions to the hospital continued to fall in several states. In recent years, health care spending growth moderated for Medicare beneficiaries across states, while premiums for employer-sponsored health plans continued to rise.